Jagadeeshwara Mandir, Sandeepany Sadhanalaya, Powai, occupies an exclusive place in the history of Chinmaya Mission. It was the first temple built by Pujya Gurudev Swami Chinmayananda and consecrated by him on November 10, 1968. 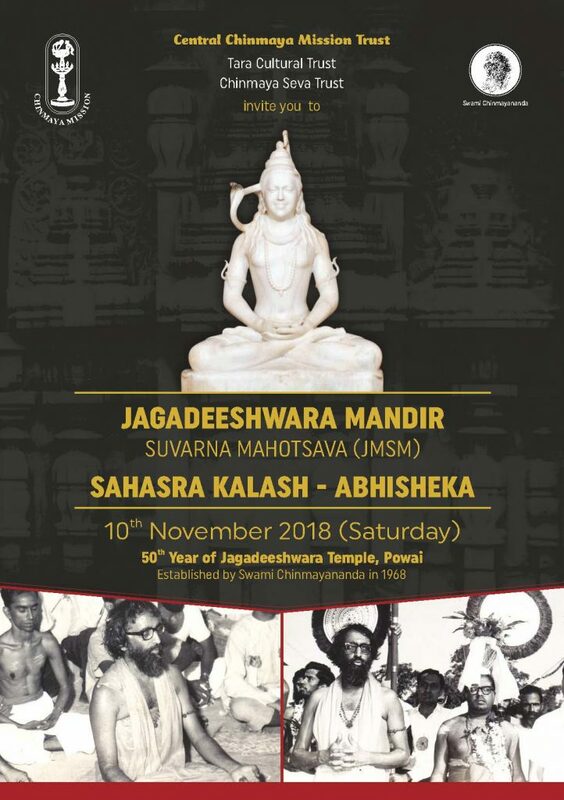 The ‘Jagadeeshwara Mandir Suvarna Mahotsava’, the Golden Jubilee of this temple, is being celebrated on November 10, 2018, through homams and a special Sahasra-Kalash-Abhisheka with waters from eight sacred rivers and various auspicious dravyas. This is a unique occasion to offer our sincere love, gratitude and devotion to Pujya Gurudev and the entire Guru Parampara – in the presence of Pujya Guruji Swami Tejomayananda and Pujya Swami Swaroopananda Yajmans have the wonderful and rare opportunity to offer abhisheka to the Utsav Linga. Mukhya Yajmans will be able to offer the Kalash from atop the pravesh dwar of the Mandir.